In the first despatch from the state, Scroll's Ear to the Ground project looks at the changes sweeping the coast and its fishing grounds. “What did you catch?” Alagairi Madhivanan shouts across to the fisherman in a small boat to our left. His answer echoes what Madhivanan has been telling me over the past hour as his small fibre-bodied boat nosed through Tamil Nadu's Pichavaram mangroves – it's getting harder and harder to find fish. As recently as a decade ago, fishermen like him in this part of the state, midway between Pondicherry and the fishing town of Nagapattinam, made one fishing trip every day. They would head out before dawn and come back with the day's catch by half-past eight. But now, Madhivanan does two trips each day – two hours in the morning and another two in the evening. His fellow fishermen – the ones with bigger boats – are staying out as long as three days looking for fish. It is the same story in other parts of Tamil Nadu. Travel further north to the fishing port of Kasimedu near Chennai and you will find fisherfolk who stay out at sea for as long as a week. Head south to Nagapattinam and you will hear that fishermen, in the quest for catch, are sailing into Sri Lankan waters, even at the risk of landing up in jail. At a village market near Pichavaram, lizardfish in a bucket. It isn't just that the catch is thin. Madhivanan and his fellow fishermen in Pichavaram say the nature of catch is changing too. According to Nethi Mani, a leader of fishermen in the Pichavaram region, as many as half of the species they used to catch ten years ago are now missing. Several species, common till recently, have almost entirely vanished. “The red snapper – we call it the sankara — scampi, kichan, motorol, sennakunni,” he rattles off the names of some species he doesn't see any longer. “These were large fishes,” he said. Other species are still around but in lower numbers than before. Fish landings data from the Central Marine Fisheries Research Institute suggests these changes are not isolated to Pichavaram. It's clear that the fish catch in the state has fallen quite precipitously. Second, catch composition has changed enormously in these 40 years. Some taxa (a group of related species) now rarely show up in the nets of fisherfolk, while others show up more than they did earlier. For instance, sharks accounted for 2.02% of the total catch between 1992 and 1993. By 2012-'13, their share had dropped to 0.12%. Turn to other taxa and you see a similar pattern. Catches of skates, rays and eels have dwindled. Those of sardines, silverbellies, snappers, pig-face breams, halfbeaks and fullbeaks have increased. 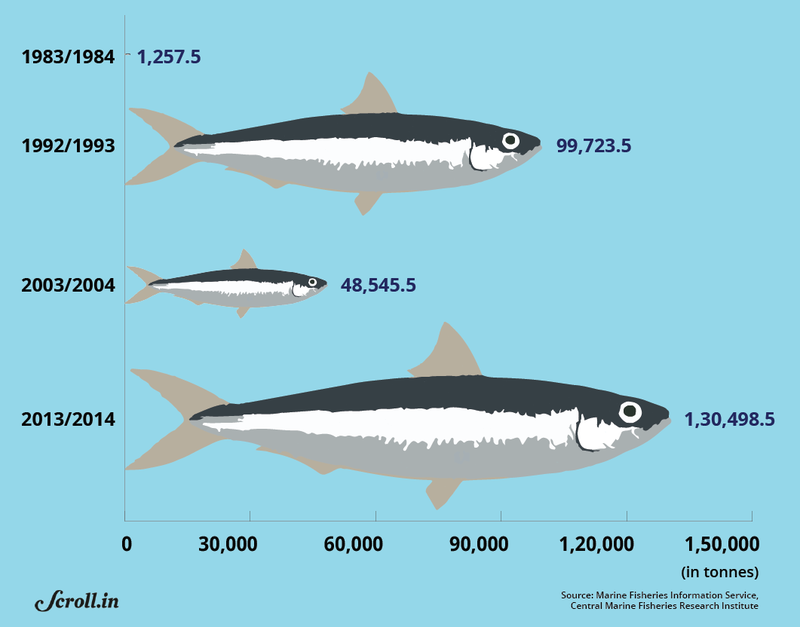 For instance, the shares of oil sardines rose from 0.47% of the total catch in 1983-'84 to 19.3% by 2012-'13. There is a pattern here. Skates, rays and eels – like sharks – are at the top of the oceanic food chain. Among others, they feed on middle predators like snappers, silverbellies and pig-face breams. Which, in turn, feed on mesopelagic feeders like halfbeaks and fullbeaks, which prey on plankton-feeders like sardines. In other words, fishermen are catching fewer high-value, large predators. Most of their catch now is lower value species further down the food chain. There are other changes. Feral, an ecological thinktank in Pondicherry, studied fish catch from gillnets (a type of fishing net), it found oil sardines were amongst the most common fishes. Their average size? Just 14 cms. This is an anomaly since oil sardines usually grow to a maximum size of 23 cms. This means the size of the fishes being caught is shrinking as well. A fisherman at the erstwhile dutching trading port of Tranquebar picks out the fish from his net. Notice how small the fishes are. This is a persistent observation in these areas. The size of the fishes caught is falling. Biologist Aaron Lobo, who did his fieldwork in these waters, has an explanation for these changes. Take the missing sharks. Around the world, he says, fishermen started by targeting high value fishes. Once their numbers started to fall, the fishermen moved to the next most valuable species, and so on, until they ended up scraping the bottom for anything – even fish previously considered not worth catching. That is what is happening in Tamil Nadu, he says. As fishermen increasingly fail to find high value fishes, they are turning to species they would have scoffed at earlier – like mackerels and sardines. Which raises the obvious question on why they are unable to find high value fish like they did before? One part of the answer is overfishing. 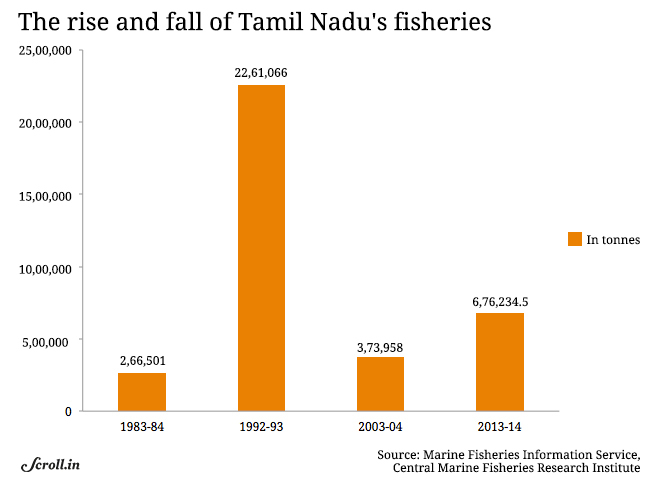 As a paper written by scientists at Central Marine Fisheries Research Institute points out, the state (and Pondicherry) saw an uncontrolled addition of fishing boats between 1965 and 1998. The authors argue this was partly fueled by state and central government subsidies for motorised fishing boats. As new mechanised boats were added, fish landings climbed and climbed, reaching 4.72 lakh tonnes in 1998. And then, they began to fall steeply, reaching 2.8 lakh tonnes by 2004. In an ideal world, the dropping catch would have led to a course correction. But then, the tsunami hit. In the aftermath of the tsunami of 2004, said Senthil Babu, a researcher with Feral, as shattered communities sought to rebuild themselves, NGOs pushed for a “boat for the boatless” package where every household would get a boat. Fishing capacity went up even more. Before the tsunami, said Babu, just 5% of all fishing was high capacity fishing like deep sea trawling. 95% of the boats were smaller, with usually three nets. They were operated by four people, including the boat's owner, who would mop up three-quarters of the earnings. "He would get three shares – for his labour, his boat and the diesel," said Babu. "The other three people would get one share each." Now, everyone had a boat. At a village market near Pichavaram, a woman sits with prawns, crabs and a basket full of catfishes and sardines. India has very little data about the health of her marine populations. On the mainland, we have periodic surveys for apex predators like tigers and some endangered species. There is no equivalent for marine biodiversity. In the absence of such data, the only major indicator for the wellbeing of marine ecosystems is the fishing landing data of the Central Marine Fisheries Research Institute. But this data too has drawbacks. 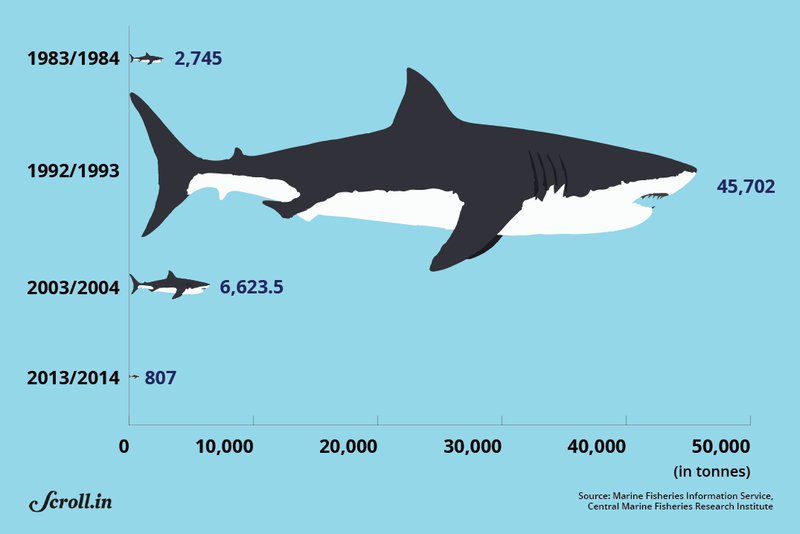 It counts taxas (groups of related species) and not species, which means we get an aggregated number for sharks but not the individual species. The more significant drawback of the data is that it tells us what has been caught but not what still exists out in the sea. Marine biodiversity at a greater risk of getting caught in the nets, and valuable enough to be transported back to the docks, will be over-represented. Put these two together and you see that the country's marine resources management machinery – from its fishermen to its planners – were fishing in seemingly inexhaustible seas. They only knew what they had caught. They did not know how much was left. Which was a mistake. As Lobo says, the high value species the fishermen were angling for – like sharks and rays – are long-lived, grow slowly, are late to reproduce and have fewer offspring. For all these reasons, they are more vulnerable to being fished into extinction – like whales almost were. Soon enough, fish traders began to notice the puzzling changes in the stocks reaching docks. Even as the number of sharks fell precipitously, there were many, many more mackerels and sardines. It's hard to pinpoint a single reason why the latter were showing up more. It could be that fishermen, due to overfishing of the high value fish, were turning to lower value fishes. It could be population dynamics – if you take out the predators, the prey will explode in numbers. It could be that changes in fishing technology – like high speed trawlers that can chase schools of these fishes – had made fishermen better at catching them. But, in these troubled seas off Tamil Nadu, humans are not the only factor at work. There is also climate change. It's warming up these seas. 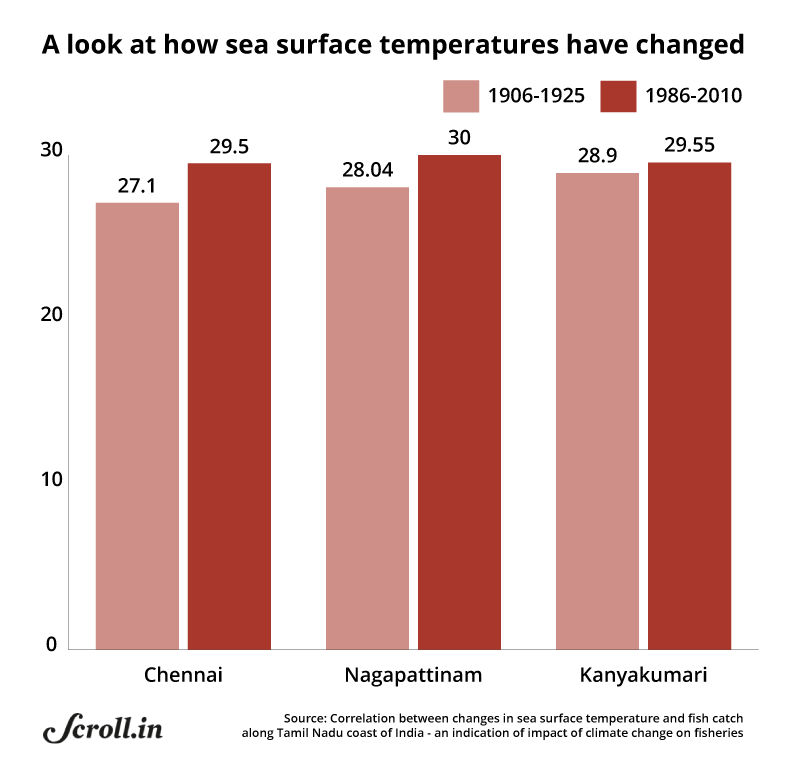 According to a paper, sea-surface temperatures are rising along the entire Indian coast. Between 1961-1976, the average annual sea surface temperature ranged between 27.7 celsius-28 celsius. Fast-forward to 1997-2005 and those numbers had changed to 28.7 celsius-29 celsius. What about the Tamil Nadu seas? Most of these changes, notes this analysis by Central Marine Fisheries Research Institute scientists, occurred in the last 20 years. As temperatures rise, marine life off Tamil Nadu is responding in different ways. Other taxa are moving into deeper waters. Take mackerel. “Caught mostly at or near the surface earlier, they are now being caught at depths of 50-100 m,” Adve observes. Drive along the road from Cuddalore to Nagapattinam and on the 130 km stretch, you will find an industrial area, a power plant, a port, a fertiliser factory, factories producing fish meal and more. These projects are the third vector changing the seas off Tamil Nadu. Ports and breakwaters, as environment reporter Nityanand Jayaraman has documented, have eroded the Tamil Nadu coast in places, and dumped sediments elsewhere. That morning, when Madhivanan took me around in his boat, he kept pointing at sandbars which, he said, did not exist even ten years ago. In the same period, he added, parts of the lagoon had become much shallower. In the middle of wide channels flanked by mangroves and opening out to the sea, there were places where one could have stood in knee deep waters. The shallow waters are warm, and hence, unsuitable for fishes that want cooler, darker waters like catfish. As fish catch falls – given the individual and combined effects of overfishing, climate change and pollution – fisherfolk have encountered the law of diminishing returns. In recent years, as the chart given below shows, for every hour of effort, the quantum of fish caught has fallen. But things are worse than they look. 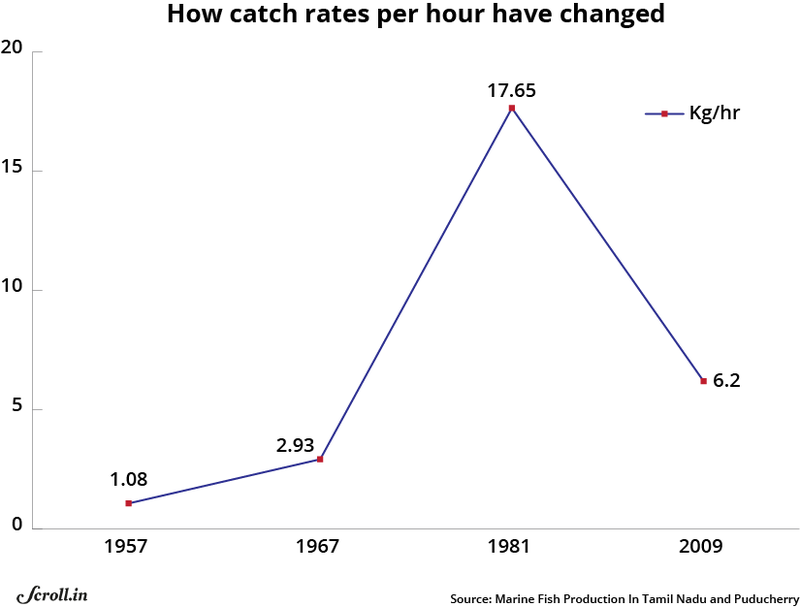 Even as the catch per hour went down, the costs of fishing rose. Madhivanan, for instance, with his small boat with its outboard motor spends Rs 2,000 on diesel every time he steps out to fish. At the same time, the quantum of fish he nets is dipping. Between rising costs and falling catch, his incomes are low and erratic.”My monthly income is sometimes Rs 5,000 and sometimes Rs 10,000,” he said. 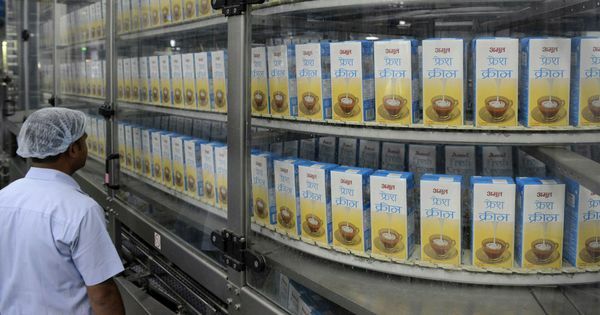 "But there are also months when there is no income – or, maybe – just Rs 1,000." Small fish drying near Pichavaram. India's boom in poultry has triggered a boom for small fish which are dried and processed into chicken feed. The boom in this market has kept fishing economically viable -- and is a major contributing factor for dwindling species being pushed towards extinction. The irony is that this combination of falling incomes, rising costs and high cost debt is pushing fishermen to further intensify fishing. This is visible in several ways. Even trawlers are fishing in the relatively richer waters closer ashore, setting the stage for conflict with the traditional fisherfolk already fishing there. In this paper, Lobo and his co-authors report that what makes trawler operations in the fishing town of Nagapattinam profitable are not the target species but income from the bycatch. It is sold to companies making poultry feed at about Rs 40 a kilo. Fishermen, eyeing bycatch, have turned to even finer nets. These are so fine that even fishlings cannot get out. This is suicidal behaviour. In their desperation, fishermen are catching fishlings that would be worth several times more as adults. By catching even youngsters before they can breed, the industry is pushing fish species – and their own livelihoods – towards extinction. This article alludes to rising indebtedness among the fisherfolk of Tamil Nadu – a trend that is common to other sections in the state. The next article in #EarToTheGround series from Tamil Nadu will look at why people of the state are getting into debt traps.